Thank you Emily! I’m so glad it’s useful. I, for one, will love looking forward to more of your ‘imperfect’ recipes! Yes, please, post more! And forget about perfect pictures. It’s real food cooked in a real kitchen (by a real person, no less!). 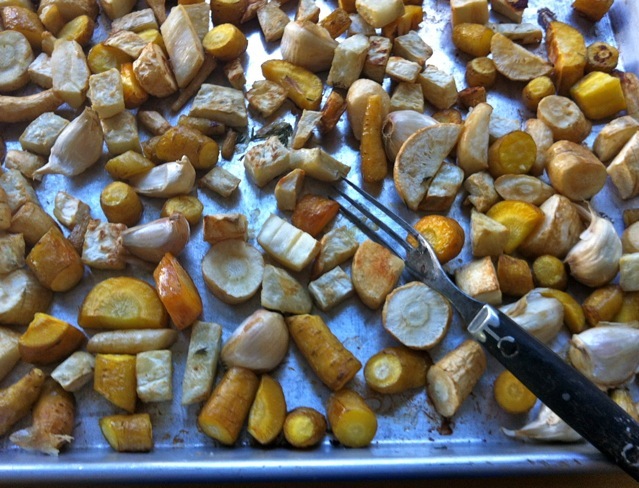 I have recently returned from preparing butternut squash for the Election night supper crowd in Middleport, NY . The butternut squash seems to possess many attributes that go unnoticed by many. Rows of stainless steel tubs filled with mashed squash were a beautiful sight. My husband and I flew to Atlanta, GA from Buffalo. While the hotel in Atlanta, I enjoyed a pickle plate that contained liberal amounts of okra and boy of boy was I thrilled! All foods had a wonderful taste, but I noticed that those in Midtown Atlanta seemed to like sweetness. I am more of a sour dill sort of girl! Keep ’em coming! Every fall, I eagerly return to your delicata / carrot hash w egg… happy to trade some photo tips for more recipes! Yes, we all benefit from that trade:)! Thanks Andrea!